Boy-howdy! Are there a lot of gift guides out there or what?! They're on my bloglovin', on pinterest, even in my inbox daily - every corner of the webernet has a guide for what you should buy this holiday season. It sort of makes me sweat and itch and my heart pounds a little. There are so many wonderful ideas and so many people I'd love to find just-the-prefect-gift for. At the Stir and Scribble house, we are working on buying less this year and making our own (or at least buying handmade), and giving experiences or our time instead. It is actually sort of a challenge when you realize that some people just want you to give them stuff. This is mostly the under 12 set, of course. I thought it be fun to share a few Simple Gift ideas over the next couple of weeks in the spirit of doing more with less. I'm posting these under the Just a Tip category, if you want to come back for inspiration. 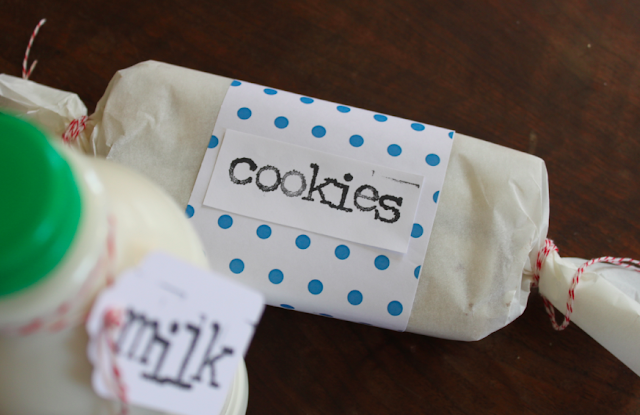 Here is one you can give now that makes a great hostess gift for holiday parties and is loved by neighbors and your husband's single-dude friends alike: Cookies and Milk. Make up your favorite cookie dough, chocolate chip and classic sugar cookies are well-loved selections, and package them with a pint of milk. I rolled my chocolate chip dough in a slice and bake style log, but you could easily scoop and chill portions and package them in a tin or takeout box. Be sure to include instructions for storage and baking. Most cookie doughs can be stored in the fridge for up to a week and frozen for up to a month before they start to act funky. Your loved one can now enjoy warm cookies at their leisure; Hey! Maybe they'll even share some of your cookies with Santa, which has got to be bonus points for you too, right? !